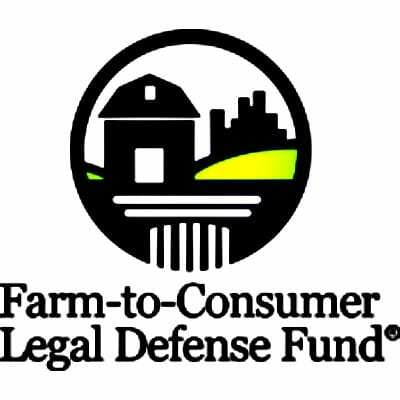 Click here to follow FTCLDF coverage of the PRIME Act. House Resolution H.R. 3187, the Processing Revival and Intrastate Meat Exemption (PRIME) Act, would give individual states the freedom to pass laws allowing the sale of custom-slaughtered and -processed meat within their states. Passage of the PRIME Act would support small farmers who currently lack reasonable access to processing facilities, improve consumer access to locally raised meats, and help revitalize rural communities. 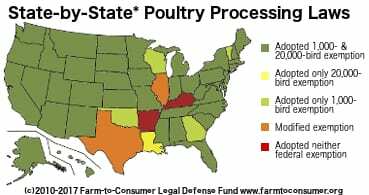 Under current federal law, meat from a custom facility cannot be sold (there are separate federal laws for poultry). Instead, it can only go to the individual or individuals who owned the animal at the time the slaughter took place. This means that the customers must buy the whole animal while it is still alive, effectively purchasing hundreds of pounds of meat without even knowing the final weight or the price per pound. This is not desirable or even feasible for most consumers. In order to sell meat, even at a local farmers market or through a CSA, farmers must take the animals to an inspected slaughterhouse. Because of the lack of inspected facilities in many parts of the country, farmers often have to haul their animals several hours to reach a slaughterhouse that has an on-site inspector. This increases expenses for the farmer, drives prices up for consumers and creates stress on the animals. Under current law, states have no flexibility to set their own standards. States may establish state inspection programs but must use the exact same standards as the federal program. In many cases, the costs are too high, for both the state and the prospective processor, to be feasible. The PRIME Act would allow states to legalize the sale of custom-processed meat direct to household customers and to restaurants, hotels, grocery stores, and other establishments that directly serve consumers in a state. States would be able to set their own standards for the processors. Four companies now control processing of over 80% of the country’s beef, and four companies control the processing of over 60% of the country’s pork.4 The consolidation of slaughterhouses has led to most meat being processed at massive plants where as many as 400 cattle are slaughtered an hour.5 Mistakes that affect food safety and quality are all too likely when six or seven 1,000-lb animals are slaughtered every minute. Meat recalls have increased substantially in recent years, evidence that the current system is not working. Small-scale custom slaughterhouses, which handle a tiny fraction of the number of animals, can provide both greater quality control and humane treatment of the animals. 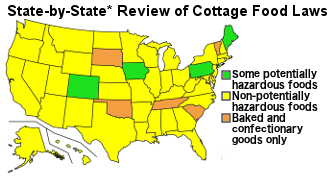 One of the federal requirements that has caused significant problems for small-scale processing is the requirement for a Hazard Analysis and Critical Control Point (HACCP) plan. This burdensome paperwork mandate has helped drive many small plants out of business without providing any meaningful improvement in food safety for these facilities. Depending on the different types of processing they are doing, small plants can have multiple HACCP requirements. Passage of the PRIME Act would enable states to devise regulations for custom plants without having to include HACCP as a requirement. The lack of slaughterhouse infrastructure is one of the biggest obstacles to a prosperous local food system. Farmers cannot meet the demand for locally produced beef because of the lack of access to inspected slaughterhouses. Passage of the PRIME Act can reduce the price of locally produced meat by allowing local farmers to use small, local plants that have regulations set by the state. The PRIME Act is a first step toward rebuilding local processing infrastructure which can revive rural economies and enable communities to become more self-sufficient in meat production. Spread the word about H.R. 3187! 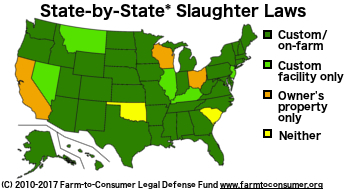 *Editor’s Note (2/26/16): Correction, the 70% decline includes both federal and non-federal inspected slaughterhouses. Revised the reference listing and added current “2” source.